This pita commercial chapati roti maker automatic tortilla maker is packed in standard export wooden cases. We will wrap the chapati pressing machine with plastic film to prevent scratches. Then use a wooden box to fix the fuselage to prevent the tortilla pressing machine from being damaged due to bumps during transportation. 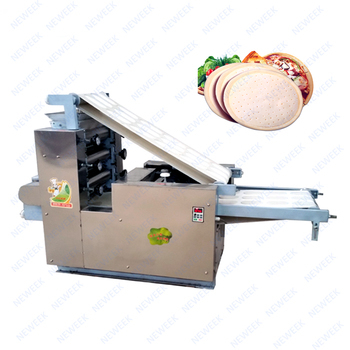 1.Working Principle of this tortilla maker:Put the dough into the feed hopper, and pass the dough wrapper that has been pressed by the three sides of the roll, and it is transmitted by the conveyor belt. The powder box of this tortilla maker is sprinkled with flour on the dough wrapper, and then formed by the mold roll. The formed dough sheet is automatically stacked, and the scrap is transferred from the return belt to the original feed hopper. 2. 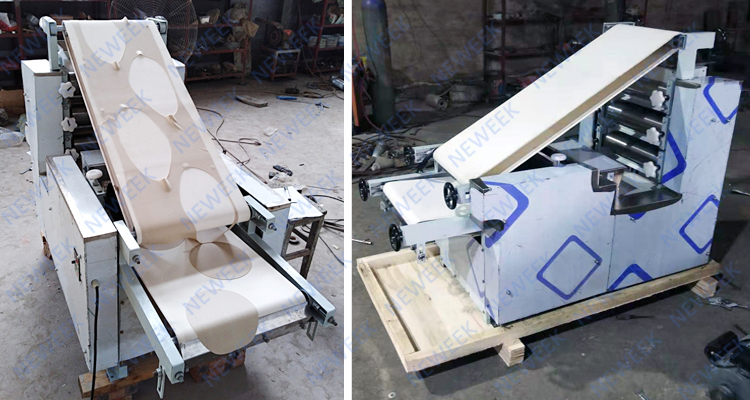 The tortilla maker adopts chain and sprocket drive, the transmission part is gearbox structure, durable, And add the automatic circulation device of leftover material, which reduces the labor intensity of the operator and increases the efficiency. 3. The thickness of the dough wrapper is adjusted by the handwheel adjuster. Mold can be customized according to needs. 1.This roti maker automatic has the advantages of high efficiency, energy saving, safety and sanitation, no corner waste, adjustable size and thickness. It makes the appearance, taste and weight of dumplings uniform in space, thus completely changing the current situation of low production efficiency, waste of staff, secondary pollution, central crack and so on. 2. The roti maker automatic is made of stainless steel or food-grade materials, with reasonable structure, simple maintenance, disassembly and cleaning. Automatic feeding, automatic powder spraying, automatic shaping and automatic skin return. Roller drawing, uniform feeding, neat panel and labor saving. 3. The roti maker automatic has compact structure, novel shape, elegant appearance, clean and sanitary, multi-purpose. 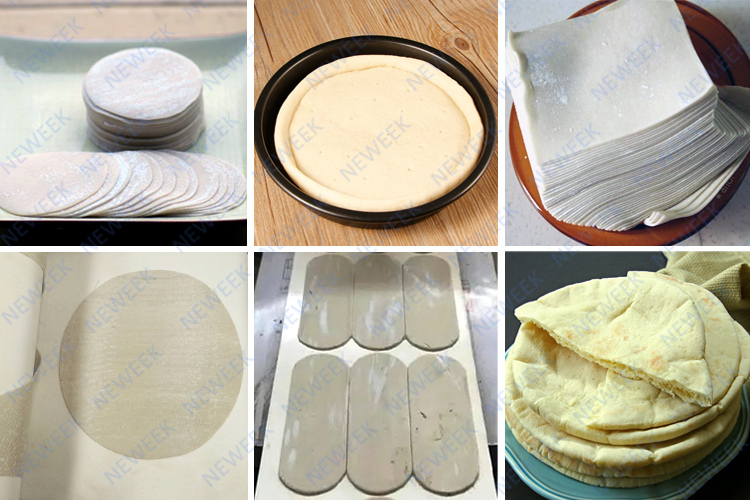 It can press various kinds of noodles such as coarse and fine noodles, wonton skin, steamed bun skin, various specifications of cake skin, etc. Its shape is neat and its thickness is even. 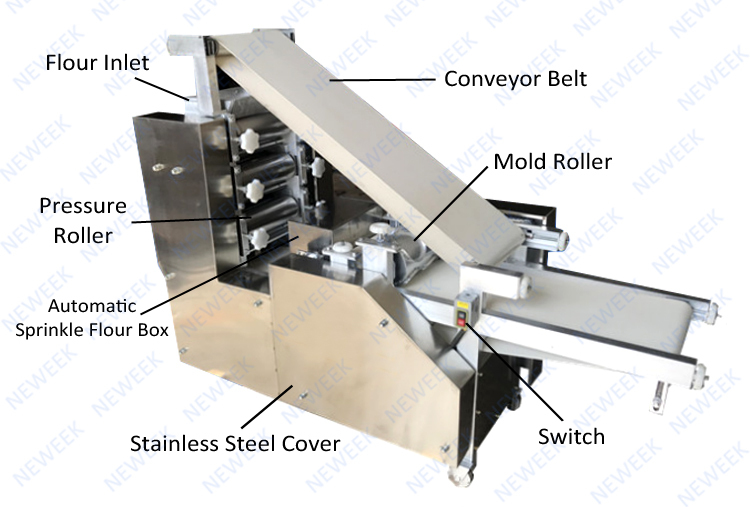 By changing the mold roller, the roti maker automatic can make arabic bread, pita bread, tortilla, naan, roti, chapati, flat bread, pizza, dumpling skin, wonton skin and other different shapes and thickness of the cake. We can also customize the roti maker automatic's mold according to your requirements. Usually, we use standard export wooden cases for packing this commercial chapati maker. We will first wrap the entire commercial chapati maker with a plastic film to prevent the machine from being damaged and scratched. Then fix the fuselage with a wooden box to prevent the commercial chapati maker from being bumped and damaged during transportation. If you have special requirements, you can contact us. For the roti maker automatic, we support TNT, DHL, FedEx, UPS. 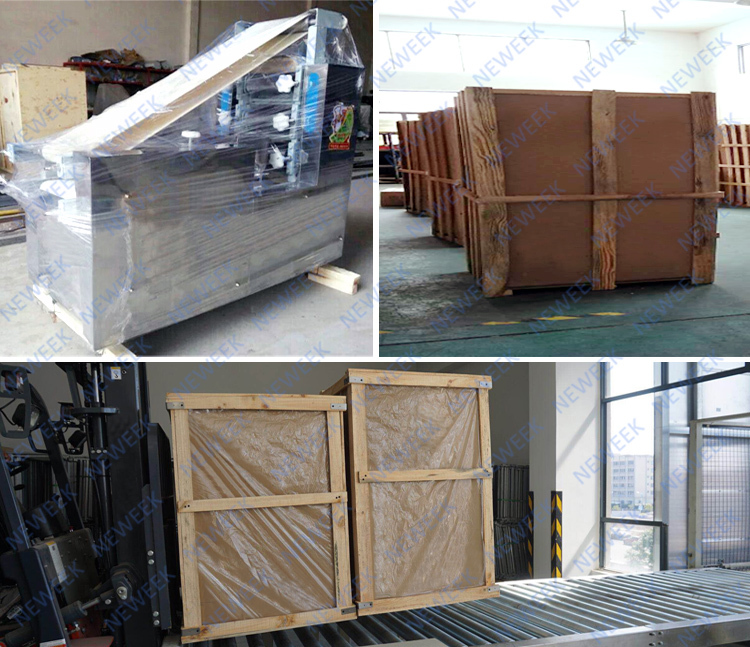 If you need, we also support delivery by ship.We can also deliver the roti maker automatic to your agent in China if you have. Zhengzhou New Week Trading Co., Ltd. was established in 2010, focuses on becoming one of the most professional manufacturer and solution provider of food machine. In order to provide better solution, we will promote team work, efficiency and encourage innovation. We try to help you, our customers, make the right choice to suit your plans, we believe you will buy more than the products from us, you become our friends and partners. As a company engaged in the food machinery industry for many years, we can guarantee the quality of the machine, from material selection to processing, manufacturing, molding, and after repeated testing, we make products with strict and scientific attitude. 1.The warranty period for this tortilla maker is 12 months. During the warranty period, machine parts other than wearing parts are damaged by non-human factors, we free of charge to provide new parts for replacement. 2.We provide one-to-one online service throughout the day. If you have any questions about the tortilla maker, please feel free to contact us. We will provide professional answers for you. 3.About this roti maker automatic, from material selection to processing, manufacturing, molding, repeated testing, we guarantee the quality of the product. 4.We accept product customization. Regarding this roti maker automatic, if you have special requirements, any parts, we can customize according to your requirements. It is our constant pursuit to make the products that customers are most suitable for. Thank you for your precious time!For more information about this commercial chapati maker, please feel free to send me enquiry and contact me!